A Cooking with Lawry's Story! It was a hot, humid August night. The South was experiencing record-breaking temperatures. 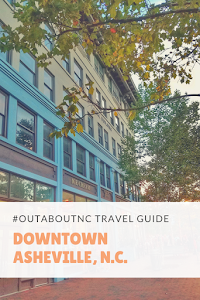 I was sweating in my own car as I drove through rush-hour traffic to get to the quaint Five Points neighborhood, in Raleigh, North Carolina. As I walked up to the charming bungalow, hostess Ilina and other members of Team Raleigh greeted me. Each of us, with our own unique talents, were ready to cook up some Southern goodness on the grill. Did I say grill in 100-degree heat? You betcha. Our culinary assignment was to create and prepare a gastronomic grilling menu worthy of special occasions and summer holidays. 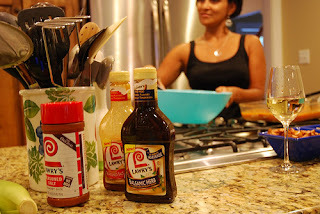 The catch was that we were to create these new recipes using two new Lawry's marinades and the classic Lawry's Seasoned Salt, as part of a contest by TheMotherhood and Lawry's. We are one of ten teams across America cooking with Lawry's in the kitchen. Our challenge was not an easy one. We were to craft our own original recipes using the Lawry's products we were assigned. It was not an option just to open the top on the marinade and pour it over the meat, like I’ve been known to do at home. Lawry's already knows their marinades and seasonings taste great alone. Our menu items, not only needed to complement each other, but they were required to make up an entire meal. I’m going to go ahead and put the rumors to rest, and say that even though my father owned restaurants all through my childhood, I’ve never created my own recipe in my life. My husband jokes that if it is not in a cookbook, then I can’t cook it. Thank goodness I was on a team with individuals who are not only great bloggers, but they also know their way around a kitchen. Ilina, our team leader and gourmet foodie, did a lot of prep during the day. 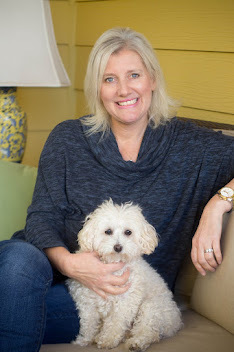 She’s an awesome chef, cooks with whole natural ingredients, rarely uses a recipe, and, like many moms, any foods with high-fructose corn syrup are banned from her kitchen. Fadra was Ilina’s well-appointed sous-chef and did what she was told. 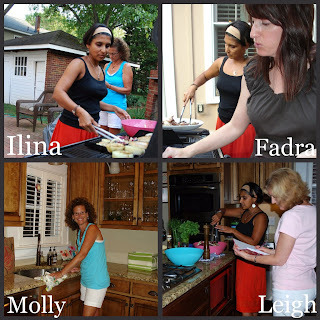 Fadra’s hobby is reading recipes, so she can really speak the language of the kitchen. She's also a great food photographer. Molly, our videographer and social media coordinator, kept us on task, and made sure the kitchen was spotless. My job, as a former reporter, was to take notes so that we could share our creations with you. It kept me away from the food prep since I’ve been known to mix up my measurements when I get distracted. Lisa and LZ couldn’t make it to our dinner in person, but they were just one tweet away from the kitchen. Lisa tackled a dessert in her home kitchen. Here's a peek on what went on inside the kitchen with our own Molly Gold. It’s fun to host a dinner party, but it’s not fun for the hostess if she spends all her time in the kitchen, and out of the conversations. As bloggers, we are never really at a loss for words, so we wanted to plan a menu that would not only wow our guests with taste, but also allow a hostess to spend time with her guests while entertaining. We felt that was a huge factor in creating our recipes for Lawry's. Holidays and special occasions need to be celebrated with a spectacular meal, with a lot less time in the kitchen. We also wanted to showcase great, local North Carolina ingredients that are at their peak during the summer months. It was the basis for our menu. Look for these recipes on the Hines-Sight Blog's Facebook page later this week. Cut raw corn off the cob into bowl. Add diced tomatoes and cilantro and gently mix. In a glass measuring cup, combine ¼ tsp of Lawry's Seasoned Salt, 2 TBS of Lawry's Balsamic Herb Marinade, ¼ cup of olive oil, and juice of one lime. Pour over corn salad and toss well. Refrigerate for at least 30 minutes before serving. Optional, add serrano pepper and/orcrumbled queso fresco cheese to mixture. Add first six ingredients to food processor (We used the Ninja Kitchen.). Pour liquid into a large glass casserole dish, and add meat whole. Turn to coat the flank steak. Marinate at least three hours (turning occasionally) or overnight. Grill about three to four minutes each side, let rest for about five minutes, and slice against the grain to serve. 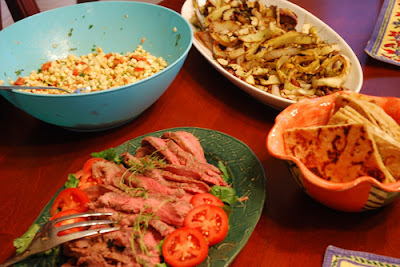 Garnish: Cut up remaining pineapple into slices, marinate with flank steak, grill, and use as an edible garnish. Vegetarian Option: Marinate portobello mushrooms instead of flank steak using the same recipe above, and grill each side until done, about two minutes per side. Combine radicchio, fennel, and vidalia Onion in large bowl. Pour ½ cup of Lawry's Balsamic Herb Marinade over vegetables. Add brown sugar and freshly cracked black pepper, (approximately five good twists of the pepper mill) and sprinkle mixture with Lawry's Seasoned Salt. Toss vegetables well. Arrange seasoned vegetables on grill pan or foil, grill for approximately 15 minutes until vegetables are tender. Brush with marinade during grilling to keep vegetables from drying out. Toss gently on a platter and serve warm or at room temperature. Combine butter, Lawry's Seasoned Salt, garlic, and thyme. Mix well. Spread herb butter mixture onto flatbread. Stack bread on top of each other, wrap it in foil, and heat on grill. Cut into quarters to serve. I’ll be the first to tell you that I thought the meal was delicious. I’m so proud of our team, and it’s an easy meal that you can create easily at home. 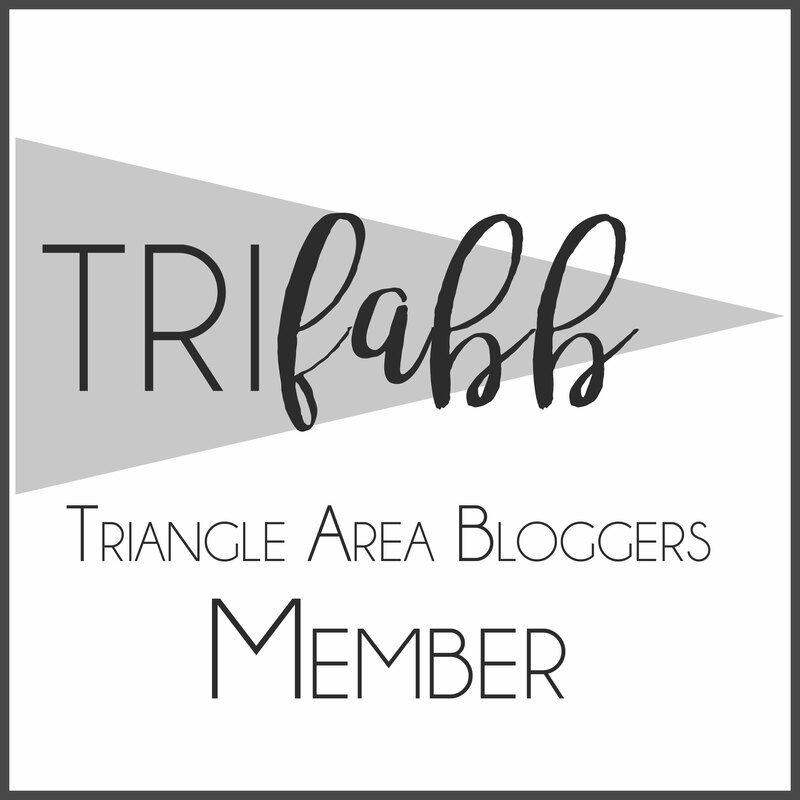 I’ve already remade the Carolina Corn Salad. My husband loved the Five Points Flank Steak. Lawry's marinades are perfect just like they are for busy weeknights, but our Lawry's Summer Grill menu is great for special occasions and holidays when you have a little more time on your hands. If you want to recreate our menu, Lawry's is offering one of my lucky readers the marinades and seasonings to help get you started. Leave a comment below, and tell me what recipe you are most eager to try in your kitchen. Deadline to enter is Wednesday, August 24. Winners will be selected in a random draw. Please include your e-mail in your contest entry. 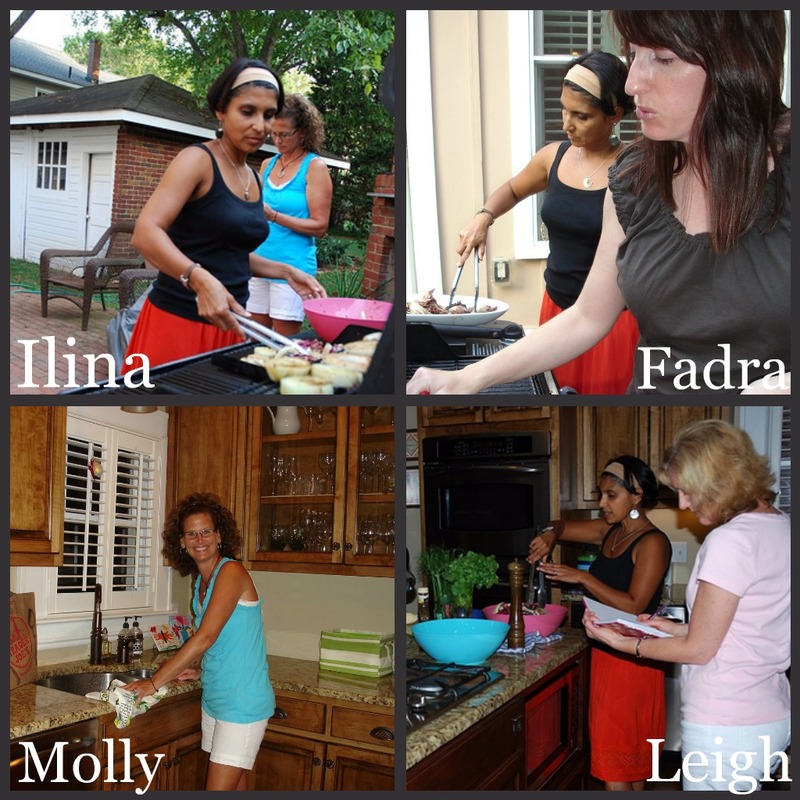 Disclosure: I was compensated by The Motherhood and Lawry's to participate in this Team Raleigh event. 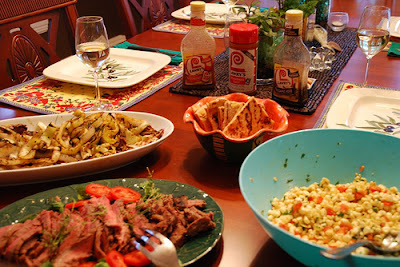 I also received the marinades and seasoning used in our recipes for me to use in my own kitchen. As always, my thoughts and opinions are my own.